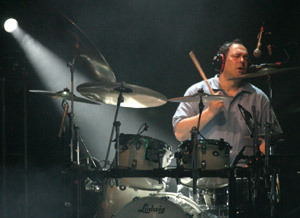 Bermuda has been the drummer with "Weird Al" Yankovic since 1980, and is seen and heard on all of Weird Al's albums, videos, and concert and television performances. That bio is deceptively brief, but make no mistake – Jon “Bermuda” Schwartz has traveled more musical territory than any sane drummer would wish for. Weird Al has covered almost every known musical style in 13 albums' worth of songs, and Bermuda's listening, writing, playing, programming and audio skills have been crucial to Al's sound, and to the success of a group described by critics as "The world's greatest cover band" and "The hands down, all time best band I've ever heard." With close to 45 years of pro playing, recording, touring, and close interaction with the music entertainment and instrument manufacturing industries, Bermuda presents some valuable insights in what he describes as a 'Real World' clinic. "I'll be mostly in front of the kit, discussing the business of being a drummer: learning and growing as a player, handling auditions, working in the studio, touring, finances & taxes, professional attitudes, endorsements, the state of the music business, and other aspects of being a working musician. No other clinics focus on these things, yet it's some of the most practical and important information an ambitious drummer needs to know. Of course I'll be discussing equipment, sounds, technology... I'll even play the drums, too!" Bermuda also offers a unique perspective on 'day jobs' and music, having balanced Weird Al's recording and touring schedule with a middle-management position for 14 years, and never missing a beat. "I hope that my experiences will be helpful and encourage those who find a career in music mysterious, elusive, sometimes frustrating, and always enticing." "There was something for every drummer to take away from this clinic!" "Jon gives great clinic. It was so cool to hear audience members leaving discussing THEIR drumming careers instead of the career of a clinican who brought mucho flash and little substance." "I was impressed with what turned out to be one of the most informative clinics concerning the music business (out front and behind the scenes) from a working drummers perspective." I've been to countless clinics in my life and yours ranks right up there with the best of them. Your clinic was very insightful, informative, and pragmatic. Thanks again.